Many people may think of the Mail Drop feature as iCloud-only, but Mac users can enable the convenient Mail Drop feature for other non-iCloud email accounts that are setup in Mail for Mac OS. This allows you to use the excellent Mail Drop feature for sending and receiving large files with just about any email account that you add to Mail app on the Mac. For the unfamiliar; Mail Drop is a feature in Mail for Mac, iPhone, and iPad, that allows you to send and receive large files that would typically not be allowed over email due to strict file size limits of most email servers. 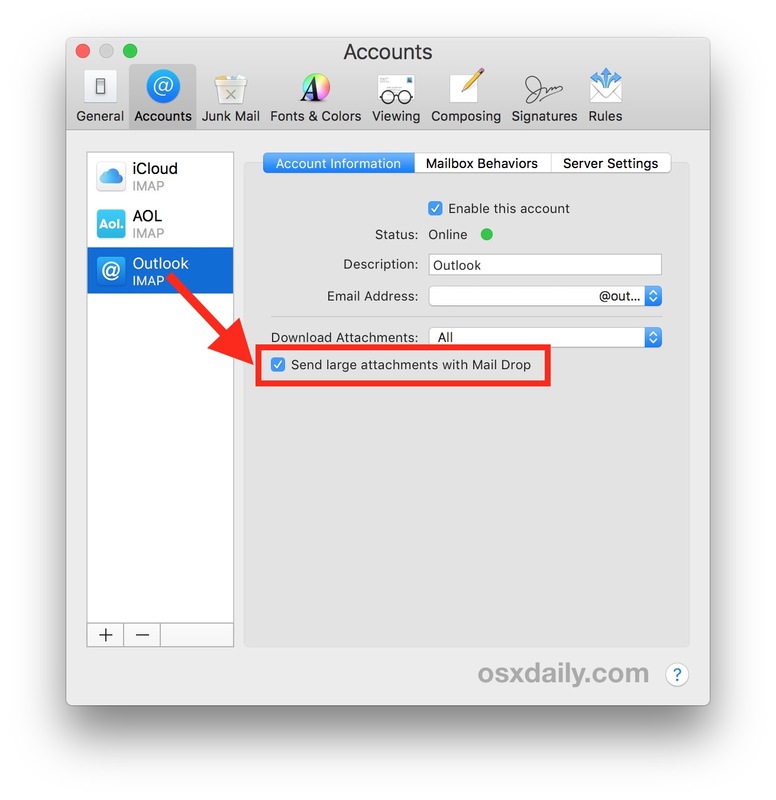 Instead, when using Mail Drop on Mac, the large file is uploaded temporarily to iCloud, and the recipient of the email gets a temporary download link to access that large file. It works quite well, and you can initiate Mail Drop sending from a Mac or an iOS device, and virtually any recipient can download the file via the link whether they have an Apple device or not. Mail Drop allows you to send files up to 5GB in size by using the feature, but remember it requires uploading the entire Mail Drop file to iCloud, which then presents itself as a temporarily available download link to the recipient so that they can download and access the Mail Drop file. Note this is not the only way you can use Mail Drop from the Mac, you can also just create an iCloud.com email address and set that up in Mail for Mac, which by default uses Mail Drop for large file transfers. If for whatever reason Mail Drop is not enabled on that too, then you can follow the same instructions below to enable Mail Drop on any email account setup in Mail for Mac. Now you can use Mail Drop when emailing large files from the Mac like you would with any iCloud account, simply by attaching a large file to the email and choosing to use Mail Drop as detailed here. In the example screenshots here, Mail Drop was enabled for an Outlook email account that is configured for Mail on the Mac. Once that checkbox is enabled, Mail Drop works the same as it would on an iCloud email account. Of course if you want an icloud.com email address, you can make an @iCloud.com email account at any time and configure it on your iOS and macOS devices. You can setup and use multiple email accounts on Macs and iOS devices without incident. Remember, Mail Drop is not just a Mac Mail feature, you can also use Mail Drop on Mail for iPhone and iPad for sending large files too. And again, the recipient of the email does not need a Mac, iPhone, or iPad to be able to download and access the Mail Drop file, as it arrives as a download link that is accessible from any email client in any operating system. Know of any other handy Mail Drop tricks? Share them with us in the comments below! Use iCloud to send large attachments. For more information about Mail Drop, see Add attachments. This option is available for iCloud, IMAP, and Exchange accounts. Mail Drop works on most email accounts anyone actually uses, so it is OK well as this is not 1996 and therefore nobody really uses POP3 anymore. IMAP is standard for email, or Exchange is common too. My main issue with Mail Drop is that the recipient ONLY receives the attachment. Any body copy that would normally be typed up in an email is not included, such as instructions and/or explanations to what the attachment is all about. So, that leaves us with having to then send yet another email to the recipient that might or might not be confused with other things. This needs to be fixed so that the original typed message will tag along as a side-car. To add onto my previous comment… I’d rather just use Dropbox where I can simply place the link directly into my email message. Dropbox is also free, is more user friendly, and allows me to still keep both the link to the attachments and the body copy of instructions all in one tidy email. Mail Drop leaves little to be desired! Mail Drop works fine with POP accounts, which I too use on my desktop machine. The problem is there is no setting to switch it on. You have to rely on a pop-up window. I made the mistake of selecting ‘don’t show this again’ assuming that it would activate Mail Drop as default but now it has turned Mail Drop off for that account & I cannot find any way to make that alert reappear!! !